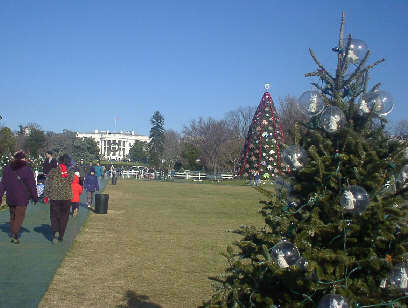 In November 1923, first lady Grace Coolidge gave permission for the District of Columbia Public Schools to erect a Christmas tree on the Ellipse south of the White House. 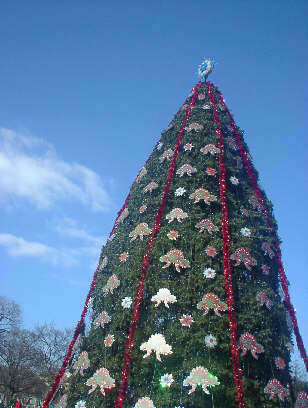 The organizers named the tree the "National Christmas Tree". That Christmas eve, at 5 p.m., President Calvin Coolidge walked from the White House to the Ellipse and "pushed the button" to light the cut 48-foot Balsam fir as 3,000 enthusiastic spectator looked on. The tree, donated by Middlebury College, was from the President's native state of Vermont. From 1924 to 1953 live trees, in various locations around and on the White House grounds, were lit on Christmas Eve. In 1954 the ceremony returned to the Ellipse and expanded its focus. Local civic and business groups created the "Christmas Pageant of Peace" Smaller live trees representing the 50 states, five territories, and the District of Columbia, formed a "Pathway of Peace." On December 17, 1954, President Dweight D. Eisenhower lit the cut tree donated by the people of Michigan. Cut trees continued to be used until 1973. Center to the season's celebration is the living National Christmas Tree, a Colorado blue spruce from York, Pennsylvania, planted on the Ellipse October 20, 1978. The tree stands as a daily reminder of the holiday spirit and of the tradition each succeeding President has participated in since 1923. The 1999 Christmas Pageant of Peace runs from December 8 through January 2, 2000 from 10 a.m. to 11 p.m.
Free evening musical presentations are scheduled for December 9 through December 23 and December 26 through December 30, from 6 p.m. to 9 p.m..